This edited article about crime detection originally appeared in Look and Learn issue number 897 published on 31 March 1979. Chief Inspector Robert Ledru of the Surete was puzzled when he put his socks on one summer morning and found that they were damp. The previous evening he had arrived at the Normandy port of Le Havre to work on a new case and had gone to sleep early, with his revolver beneath his pillow. He had no time to puzzle out what had happened to his footwear – his shoes also appeared to have been out in the wet – and he hurried off to introduce himself to the local police. Ledru had been sent to Le Havre to solve the mysterious disappearance of some seamen in the area. But on reaching the police station he was told that his case was now of secondary importance. There had been a brutal murder during the night and it was hoped that he, Ledru, would help to try and solve it. The victim was a middle-aged man named Andre Monet, the proprietor of a Paris dress-shop, who had recently come to the coast for the good of his health. His body had been found on the beach that dawn. He had been killed by a bullet which had passed right through his body. His wife was being informed of the tragic death and the search for the missing bullet was in full surge. Intrigued by the killing – for which there appeared to be no reason, motive, or suspect – Ledru went to investigate the scene of the crime. Eyes on the alert, he walked along the sandy beach to the spot where the corpse had been discovered. The detective noticed a set of footprints leading up to and away from the dead man and stopped to examine them. When Ledru arose his face was troubled and he ordered that plaster casts be made of the marks. Ledru spent the rest of the morning gazing at the plaster casts – which he took to a remote part of the beach and studied as if they were about to reveal something vital to him. He refused to question fishermen and beachcombers who might have had something useful to say, and sat for hour after hour, his head clasped in his hands. The bullet was handed to him and he took out his revolver. He noted that a round had been fired, and compared the recovered bullet with the one in an unfired cartridge. At the age of 35, Ledru was famed as the man who caught murderers and who opposed all violent law-breakers. He had made his name in Paris, where he had broken up black magic cults and had arrested scores of anarchists. Three years earlier, in 1884, he had enjoyed one of his greatest triumphs, when he had tracked down and seen imprisoned a group of political rebels who planned to overthrow the government. Ledru had followed this by rounding up the French members of the Brotherhood of Social Order, an underground political organization which sought world dominance. Although the Brotherhood’s headquarters were in Germany, it had spread what Ledru called its evil tentacles throughout Europe and Great Britain. It was this indifference to a person’s position of power, plus an unswerving dedication to stamping out crime, that prompted Ledru to name himself as an apparently cold-blooded and ruthless killer. With the plastercasts and death bullet in his possession, he took the next train to Paris, where he reported to his superior at the S√ªret√©. 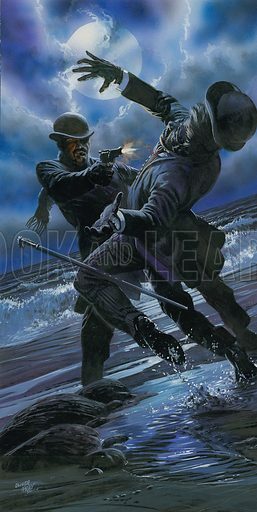 He poured out the story of the body on the beach and related that the victim had been shot by a German pistol. Ledru reconstructed the murder stage by stage. The killer, he said, had woken up in the middle of the night and put on his socks, shoes and clothes. He had then left his first-floor bedroom by the window and had made his way to the beach, with its long stretches of sand and rock-pools. There he had come across Monsieur Monet taking a midnight stroll and had, it seems, got into conversation with him. Ledru then described how the killer drew his gun, shot the Parisian through the chest, and left the victim to die. The murderer hurried back to his home, hotel, or lodging-house, climbed in through the window, returned the gun to its hiding-place, and went to bed. At first, the heads of the Surete found it difficult to believe Ledru’s fantastic story. But gradually, as the evidence was once again examined and pieced together, they came to believe that he had indeed killed in his sleep. He was said to be suffering from too much work and too many mental problems, and was imprisoned for his own good. While in jail he was given a pistol loaded with blanks and a close watch was kept on him day and night. Then, one midnight, Ledru rose while still asleep, took the gun from under his pillow, and fired at point-blank range at one of his guards. This convinced the authorities that he had been telling the truth, however unbelievable it sounded. From then until his death in 1937, Ledru lived in seclusion on a farm outside Paris. He was watched over by doctors and armed personnel, to whom he sometimes told the weird, true-life story of the detective who caught himself.